Hi everybody! 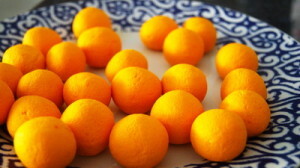 I need to let you know (who never heard of Komola bhog) that it is actually orange flavoured rosogolla(yummyyyyyyy). It is little bit bigger than usual rosogolla. 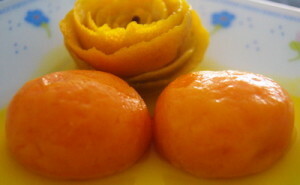 I am doing recipe because I get lots comments that some of us fail to make perfect rosogolla. 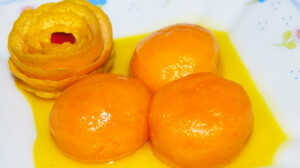 Trust me after making more than 30 times perfect rosogolla still I feel Rosogolla is the trickiest one. • It needs to be exact moist in chhana and exact heat. • When you are making chhana, vinegar needs to add at boiling point. 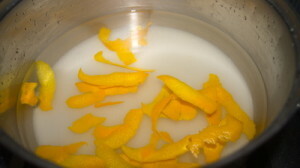 • Chhana needs strain as soon possible and then wash chhana with cold water. • Chhana needs to knead well. • Cook it on medium heat. Hope I am not making more confused. But once you make perfect one, you will never fail again. So don’t be disappointed, try one more time. And one more thing if your rosogolla break into pieces, make it rosomalai or sondesh with it. If it is too hard, cut them then put into malai. Hope it will help you not to stop making Rosogolla. Now come to Komolo Bhog. 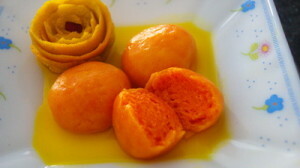 Komola means orange (mandarine). Some of us make it simple and use orange essence. But think that orange essence was not available when Komola bhog is used to make. I used here orange rind to give orange flavour. 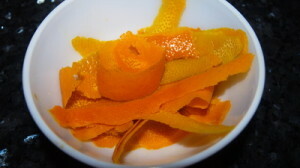 If you find hard to use orange rind, please orange essence then. Hope this lovely dessert will bring smile on your face. . With lots of love thanks again and don’t forget like my facebook page or join my facebook group to keep in touch with me. 2. The cheese needs to be kneaded 2 minutes. Then add sugar, semolina, plain flour, self raising flour, food colour and saffron imitation. Knead the cheese until your palm feels a little greasy and colour mix well. You can use food processor for kneading then it will be a lot easier (I like to use food processor for knead). 3. Now divide the dough into 18-22 equal parts and make them into smooth balls. 4. 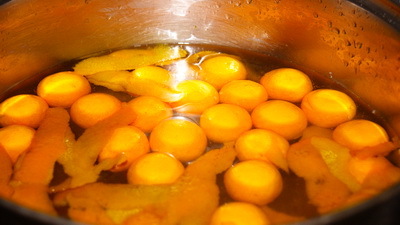 Heat the pan with 7 cups water and add the sugar and orange rind on medium high. Bring it to boil and add the cheese balls to the syrup. Cover the pan with the lid. 5. Need to boil the cheese ball 45 minutes but need add ½ cup of water in every 10 minutes. 6. Remove koloma bhog from heat and let it cool down. 7. Serve Komola bhog chilled or room temperature and enjoy. ami bangla jani. Video dite parle amar-o bhalo lagto ..kintu aro duita hat r kichu somoy dorkar. inshallah odur bhobisote korte parbo. dua korben desher khabar prithibir sob jaygay r sobar modhe chhoriye dite pari. misti syrup patla hoar kotha. maybe something wrong with chhana. chhanna over cooked or too dry hole misti hard hoy. hope apnar self raising flour fresh chilo. jokhon chhana banabe , milk boiling point -e asle vinegar add korun , stir with spoon, chhana katle , strainer -e dele din, cold water add korun. cold water use korle chhana dry hobe na r vinegar dhuye jabe. misti medium heat-e boil korbe. asha kori porerbar perfect misti paben. thanks. Rownak, your recipes are simply awesome and simple. I tried your chomchom, now I am going to try Komola bhog, pl let me know saffron and saffron imitation are same or not. Or pl let me know what is saffron imitation? Thanks. Saffron imitation is actually orange colour. If you can not find it, use orange food colour. Thanks. 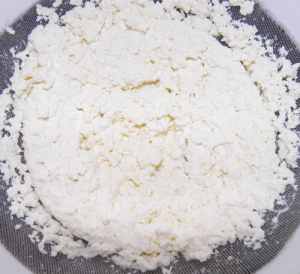 Semolina hochhe suji r self raising flour hochhe baking powder misano flour. ready made kinte pooa jay.. self raising flour na thakle baking powder r moyda misiye nileo hobe..